help directory can be extracted in same directory where mht2htm executable is. In that case help can be called directly from program. 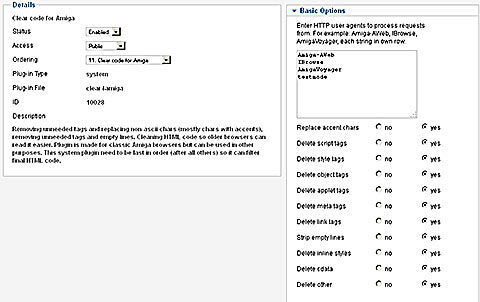 Clear4Amiga or Clear code for Amiga is plugin intended to clear HTML code generated with Joomla!, to strip codes not compatible with HTML 3.2 or HTML 4.0. Plugin will clear code only for selected Web browsers so data will be altered only for e.g. older or mobile browsers. In combination with compatible template same site and same articles can be CSS formated for modern browsers and converted to HTML 3 for ancient browsers. 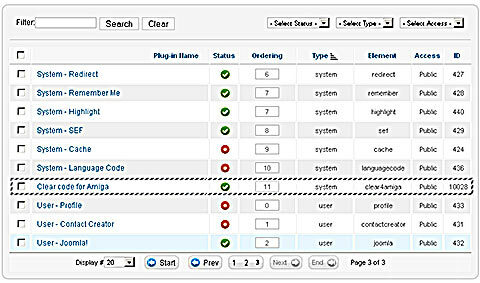 Plugin sould work with Joomla! 2.5.x (1.6, 1.7), up to version 3.x. This system plugin should be last in the list so it can filter final HTML codes. Settings have one text field and several radio buttons. In text field strings, or substrings of HTTP user agents should be written each in own row. will filter page only if request is send from selected browser. Delete script tags will remove all <script> .. </script> parts from code. Delete style tags will remove all <style> .. </style> parts from code. Delete object tags will remove all <object> .. </object> parts from code. Delete applet tags will remove all <applet> .. </applet> parts from code. Delete meta tags will remove all <meta> .. </meta> parts from code. Delete link tags will remove all <link> .. </link> parts from code. Strip empty lines will remove all empty lines. Delete inline styles will remove all inline style parts from other tags (style=" .. "). Delete cdata will remove all <! [CDATA[ .. ]]> parts from code. Pay extra attention to this one! Sometimes it will delete <!DOCTYPE. Delete other is for future cleanings (and may do nothing right now). If value of HTTP_USER_AGENT contains 'Amiga' then first html code will be shown. If not then other template will be used. Resulting page will be matching for web browser.